KTSL's studios were located at 3800 Mount Lee Drive until 1948, when all of the Don Lee stations moved in to new digs at Vine and Fountain in Hollywood. They would remain there until 1960, sharing space for nine of those years with competitor KHJ-TV. KHJ-TV itself moved to 5515 Melrose in 1964, handing its old studios on to KCET (28), which signed on that September. KNXT had moved to Columbia Square (6121 Sunset, at Gower) in 1960, later becoming KCBS-TV; KHJ-TV remained on Melrose until 2004, when (as KCAL-TV) it too moved to Columbia Square, having come under CBS ownership. Both stations moved to CBS Radford in 2007. For what it's worth, the taller mountain just west of Mount Lee is Cahuenga Peak. 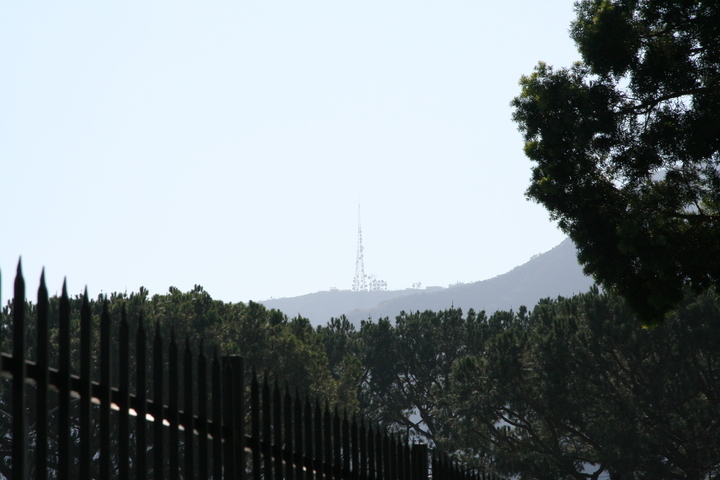 There are, incidentally, two other notable radio facilities in the Hollywood Hills; a tower on an apparently-unnamed ridge east of Mulholland and Laurel Canyon is home to a KSSE (107.1) booster; and the Briarcrest tower (KCBH/KJOI/KYSR 98.7 and KCRW 88.9) is about three miles to the southwest.